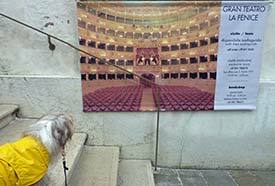 ABOVE: Maggie of Maggieinvenice.com admires a tour poster at the Gran Teatro La Fenice. The Gran Teatro La Fenice has a Web site at www.teatrolafenice.it, with English-language information about performances, tickets, directions to the theatre, and other topics. The official directions are a bit vague if you're unfamiliar with Venice, but a good map will help you find the opera house. Google's satellite photo map is useful tool: The default view shows La Fenice's location in the sestiere of San Marco, and you can zoom in for a better view. The self-guided tour lasts about 45 minutes and does not include backstage areas. Allow extra time if you want a drink or snack in the café. You can visit the book and gift shop in La Fenice's lobby without taking a tour.